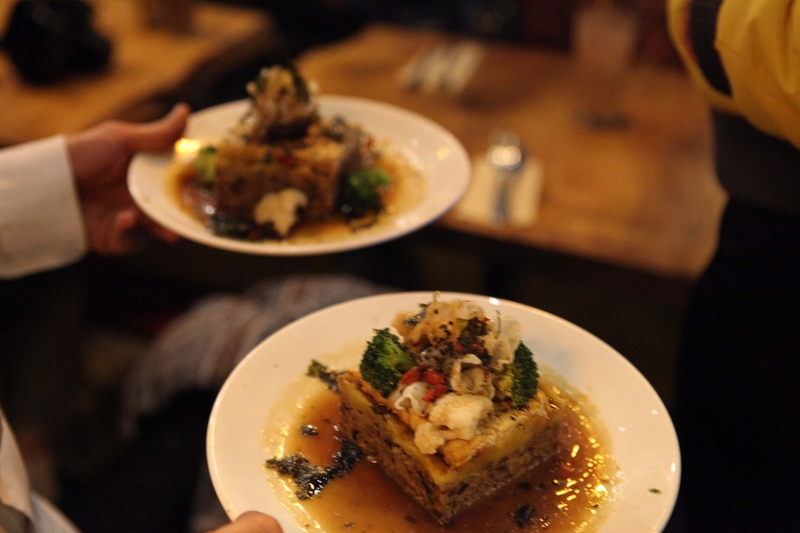 When I moved to Glasgow in 2013 – the year that PETA recognised the city as most vegan-friendly in the UK – there was already a number of well-established vegan restaurants in the city. Even though I was not vegan then myself, I frequented some of them regularly. Since then, I have become vegan – and just at the right moment, as the vegan food scene in Glasgow has practically exploded. Eating out as a vegan in Glasgow is easier than ever before and every few months a new vegan place is opening its doors. 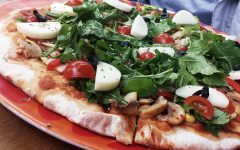 While in 2013 PETA spoke about roughly 20 vegan and vegan-friendly restaurants, a recent review I conducted for a directory on my website GlasgowVeganGuide.com shows that this number has increased at least fivefold. 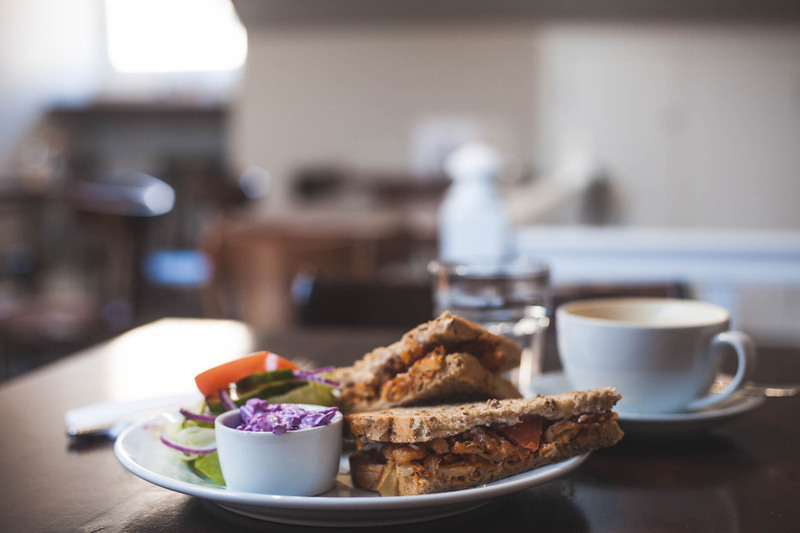 Almost every restaurant in Glasgow is able to accommodate vegan customers to a certain extent, some offering just one or a few vegan options, others providing a whole separate vegan menu to choose from. 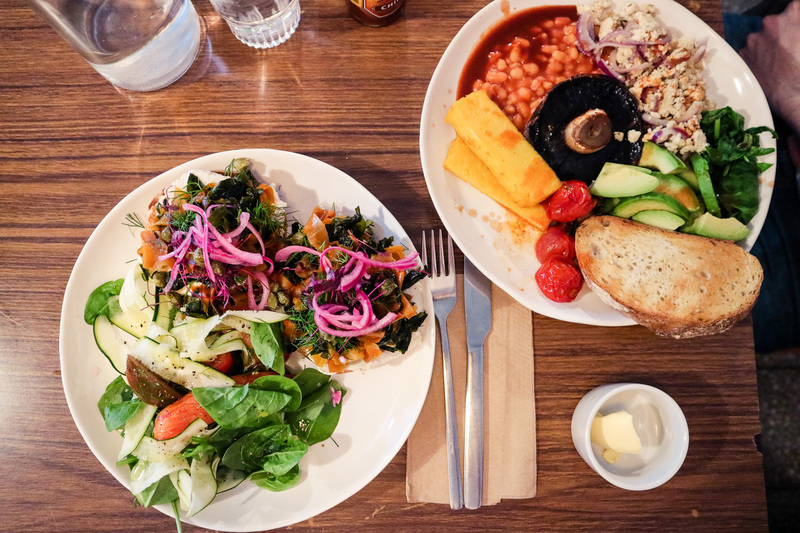 Veganuary is particularly popular with the local community and many restaurants offer special deals as incentives to give a plant-based meal a shot. 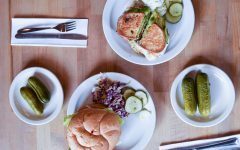 One thing that I noticed is that a large number of these new vegan-friendly restaurants, is run by amazing women, who with their cooking skills want to bring some positive change into their local communities. I sat down with five of them to hear more about their journeys and find an answer to the question, why they and so many other women open their own vegan businesses. Let’s Dance to Soy Division! Throughout our conversation Debbie goes off-topic a little and tells me stories about her cats and dogs. Being a cat owner myself, with an entire folder on my phone dedicated to photos of my furry baby, I appreciate that; but it also underlined the fact that Soy Division grew out of a deep care for animal rights. 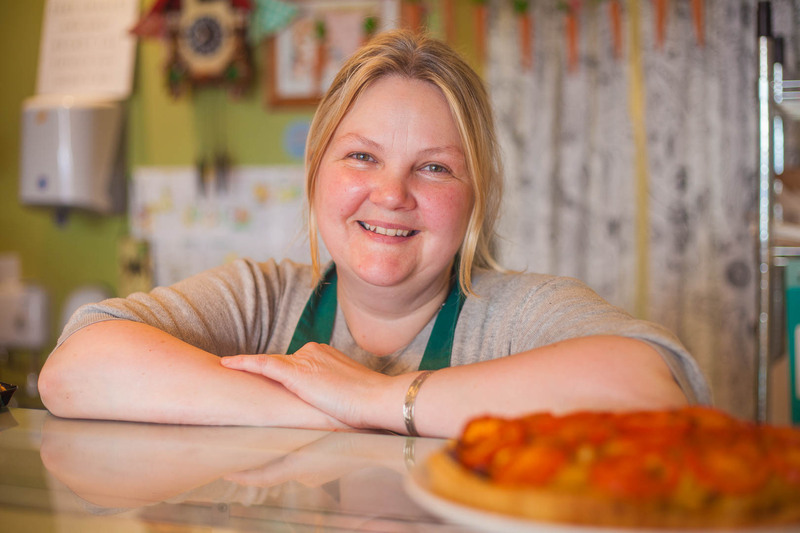 Debbie wanted to create and promote vegan options, so that no animal would have to be harmed again; the fact that she thus also provides healthier food options and created a welcoming atmosphere beneficial to the local community are just most welcome side-effects. Get your vitamins at Picnic! While you can order a few dishes containing vegan meat or dairy substitutes, Michelle’s focus really lies on healthy wholefoods. Freshly blended smoothies with names such as Glasgow Green or Yellow by Yellow, are joined by nutritious meals like a Raw Pad Thai salad, a Black Rice, Kale & Basil burger or all kinds of wraps. 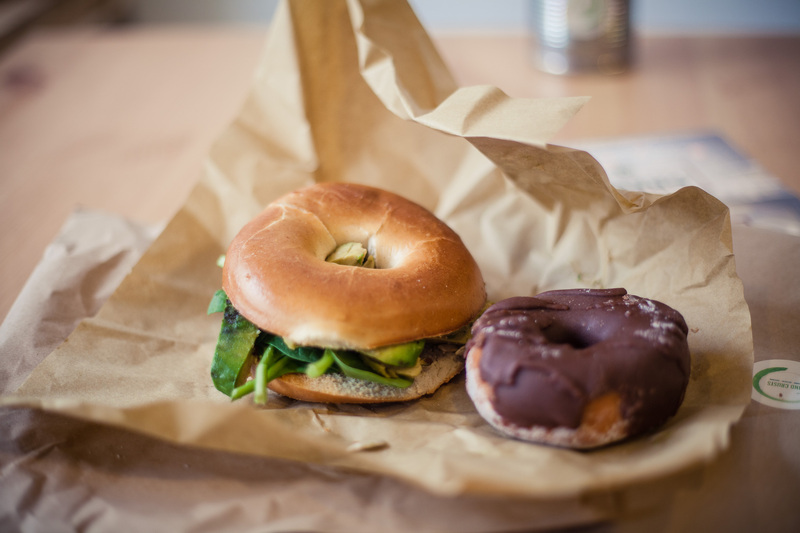 Of course, there are also plenty of breakfast items and options for a sweet afternoon delight on the menu. 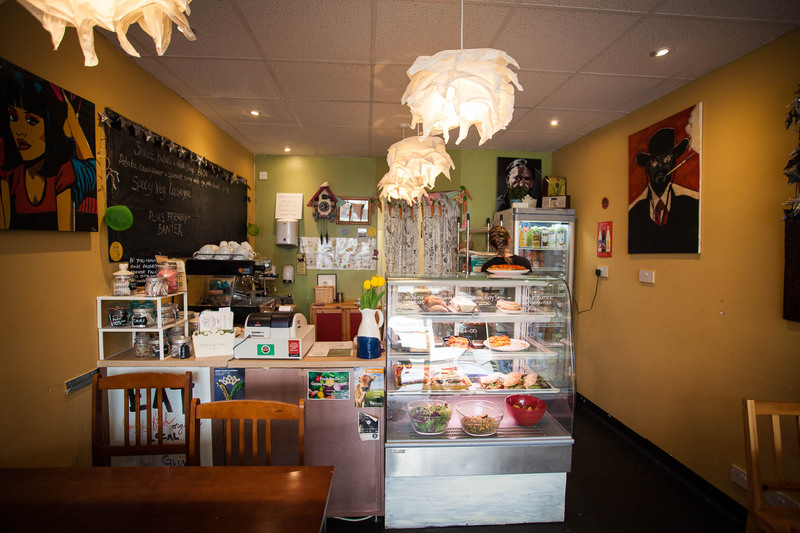 With a menu so diverse, it is no surprise that the cafe reaches far beyond the vegan locals as well. ‘Since I went vegan, I wanted to find ways of encouraging people to explore cruelty-free options. We’d like to appeal to as many people as possible, vegan or otherwise.’ At her cafe, she wants to introduce cruelty-free, healthy and environmentally friendly food to as many people as possible, and if someone enjoys their food at Picnic and only finds out that it was vegan after finishing their plate, Michelle considers that deed done. Reaching as many people as possible is also the dream of Kathryn Veroni, owner of the bagel and doughnut shop Kind Crusts. ‘My overall aim is to expand across the UK and eventually launch a franchise model. 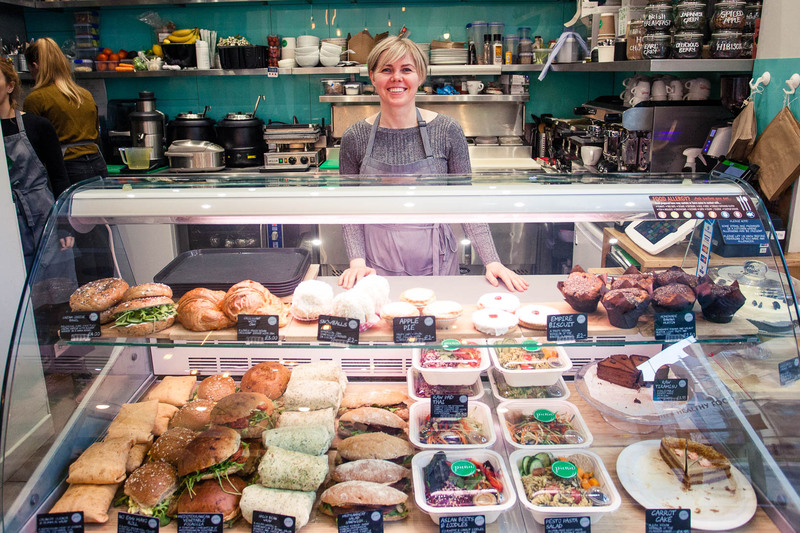 Picture Subway or Greggs, but vegan and ethical.’ For now, Kathryn operates her bagel revolution out of her new cafe in the East End of Glasgow. 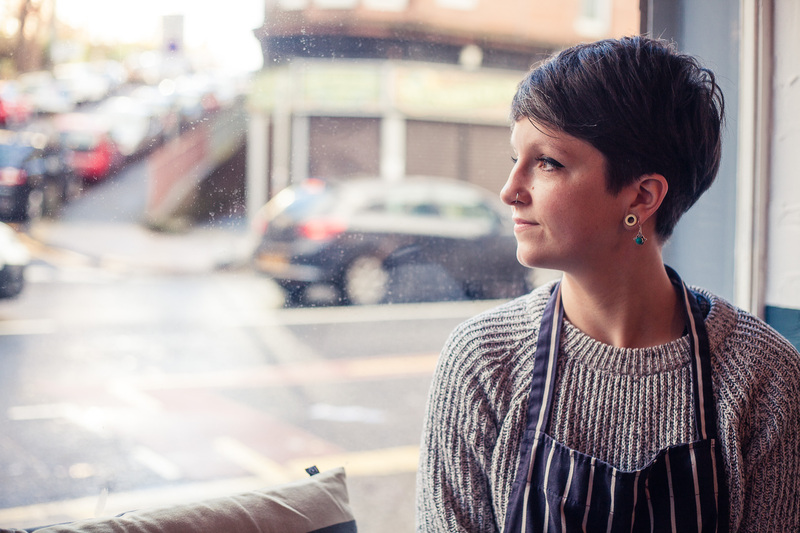 While she was one of the first people to open a fully vegan cafe in Glasgow, she recently moved to new premises on a main road and is now even more visible in the local community. But it was not always like that. ‘When we opened, the idea of a vegan cafe was still very unknown territory. 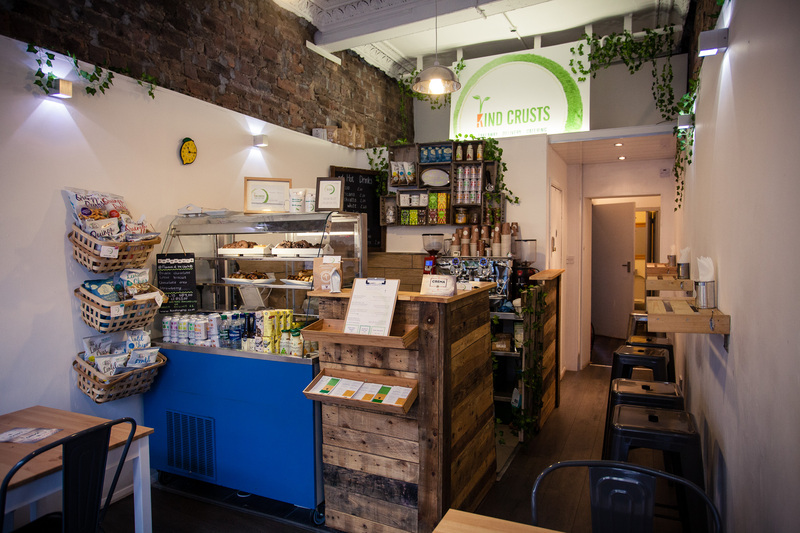 Some locals couldn’t grasp that we didn’t sell their beloved rolls and bacon, and school kids thought it was hilarious to chuck pieces of square sausage at the shop.’ Much has changed since then, and the cafe has found its place in this traditional Glaswegian neighbourhood. 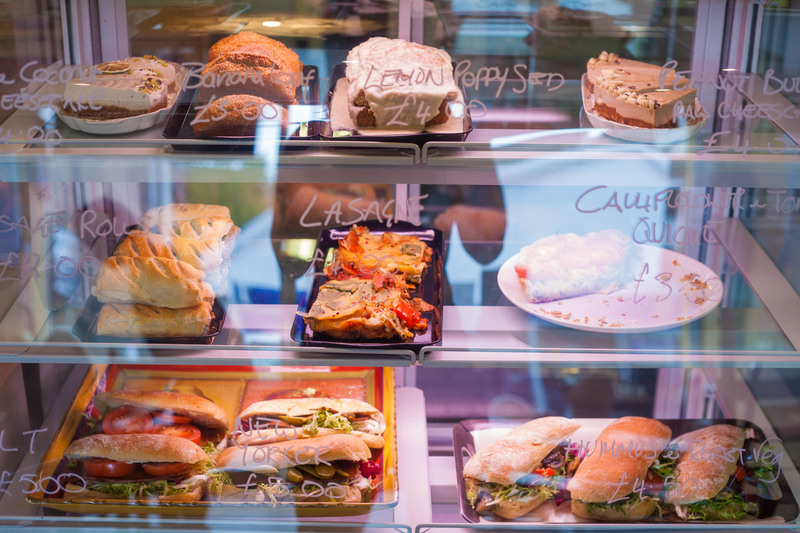 Apart from weekly changing doughnuts, which can be bought by the piece or in boxes, Kind Crusts offers a variety of bagels and sandwiches for breakfast and lunch, filled with anything from smoked carrot or onion bhajis to herby meatballs or seitan chicken. Initially, the menu also offered one vegetarian option containing cheese from a small local farm. Kathryn had hoped that this would attract more non-vegans to visit and try her food, but she quickly realised that it was not the right decision. 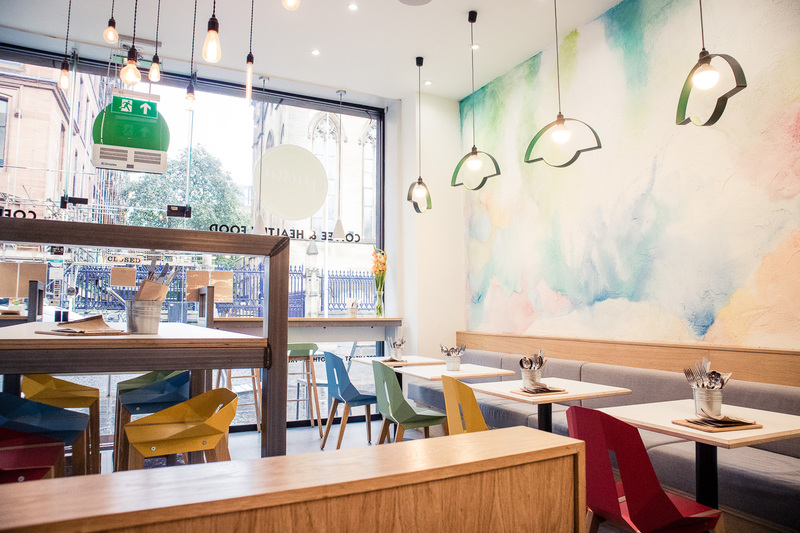 ‘After a few days of working with dairy, I felt that I had sold my soul.’ So, just a week after opening, Kind Crusts became the fully vegan gem it is today. And give back she does. Soon the cafe will start to support community initiatives in the city of Glasgow and, who knows, maybe one day we will be able to find Saffy’s own chilli raita on the shelves of our local supermarkets. Everybody’s welcome at Mala Carne! What the stories of these five women have in common is a passion to create new opportunities and give something back to their local community, but also an element of sacrifice – giving not just time and resources, but also commitment to a greater cause. Speaking about feminism, I was interested to hear the women’s experiences of everyday sexism in their positions as leaders – and I was surprise by their responses. Not one of them had experienced issues running their businesses based on their gender – and that is not something you hear very often. On the contrary, all five of them emphasised the incredible support of the Glaswegian people, other business owners and local officials; men and women alike. ‘People’s initial perception of vegan food can be an issue, other than that I have only experienced support,’ says Michelle from Picnic. And this brings me back to the question, why there are so many women in particular spearheading the vegan cafe revolution in Glasgow. Glasgow is rich in strong women running successful businesses. There are many female role models to be found in Glasgow, leading the way in music, arts, politics and science – the café owners mentioned here are just the tip of the iceberg. And yet, they are crucial, because they are impossible to overlook in every-day life. ‘If you see other women following their dreams and running their own businesses, then you feel more like you can do it too. It is great to see not only male chefs opening restaurants or running kitchens,’ says Claire and tells me about her own business role model – her mum. 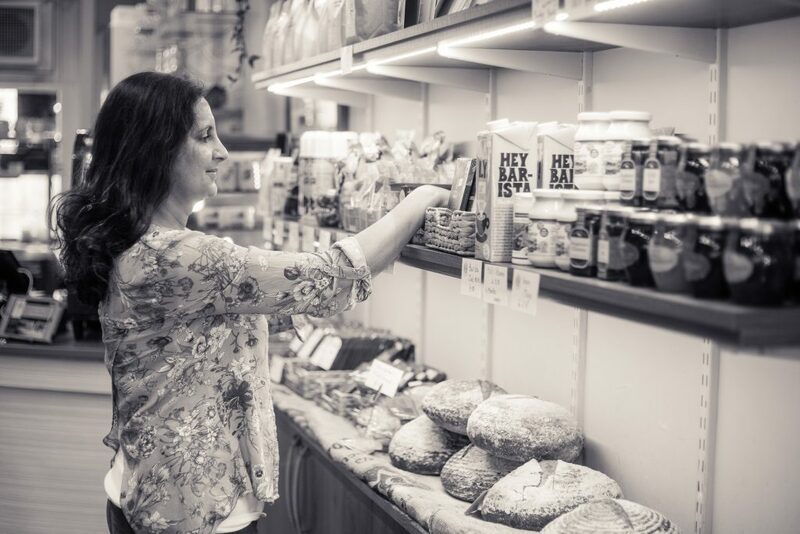 Debbie, Michelle, Kathryn, Saffy and Claire are not only great chefs and passionate entrepreneurs; they are role models, who greet you in their shops day after day, spreading their message of kindness, well-being and inclusivity through food. Just walk up, and hear what they have to say!